As today is the last day of September and National Sewing Month, I thought I would share a few other ways I have my sewing studio set up for ease of use. Please see my post from last Monday to see my favorite methods of fabric storage. 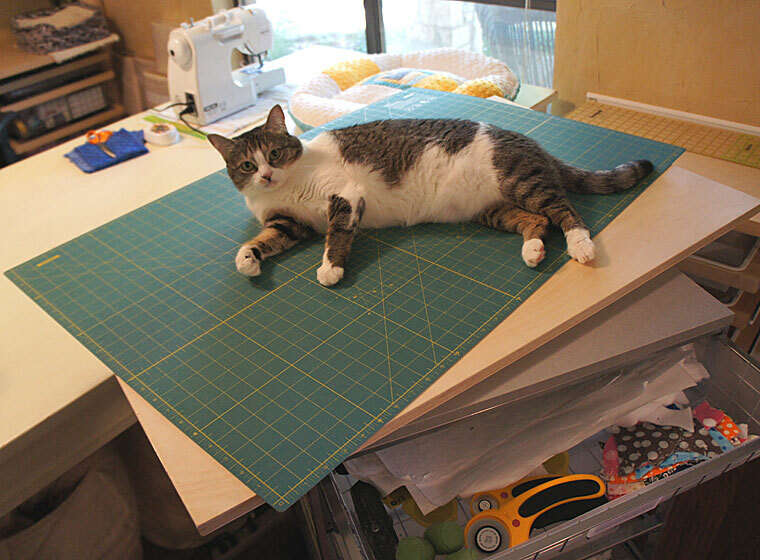 There’s one thing you can’t ignore with sewing, and that is how you set your space up for cutting fabric. One of the main reasons I like to sew smaller items is that it makes setting up the space for this task much easier. I only use a 2′ x 3′ cutting mat, along with my 2′ Omnigrid ruler, 6 1/2″ Omnigrip square, and rotary cutters for all these chores. The real trick here is to get your cutting board at the right height for you, so that you don’t develop unnecessary back problems! Along with my cutting space I also wanted an organized area to store all my patterns I have developed. I knew that narrow trays would be the perfect solution. I found the right combination for cutting/storage at the Container Store, by combining two of their 16″ stackable Elfa drawers with six narrow trays and one medium tray. These trays pull out for easy access to my patterns, and in fact the top tray holds my rotary cutters and extra blades as well. The deeper tray at the bottom holds my Toughtek fabric, which is quite heavy, and the freezer paper I use for all my pattern making. Labels on the fronts of drawers make contents quickly known. I added the Container Store’s “stick on” silver melamine to the top of the unit, and attached four casters to the base. I have never needed to use the locks on the casters (stays steady enough for cutting without the need to do that), but this addition makes the entire unit easily movable for times when you might need the space for other things. Since the melamine top is approximately 21″ square, it is not quite the right size to support the 3′ x 2′ cutting mat. Another solution – I purchased a lightweight 1″ thick drawing board, which just happens to be exactly 3′ x 2′, from my local Michael’s store to give my cutting mat the support it needs. Perfect! And again if space is needed you can easily take the cutting mat/board combo off the top and store away as needed. 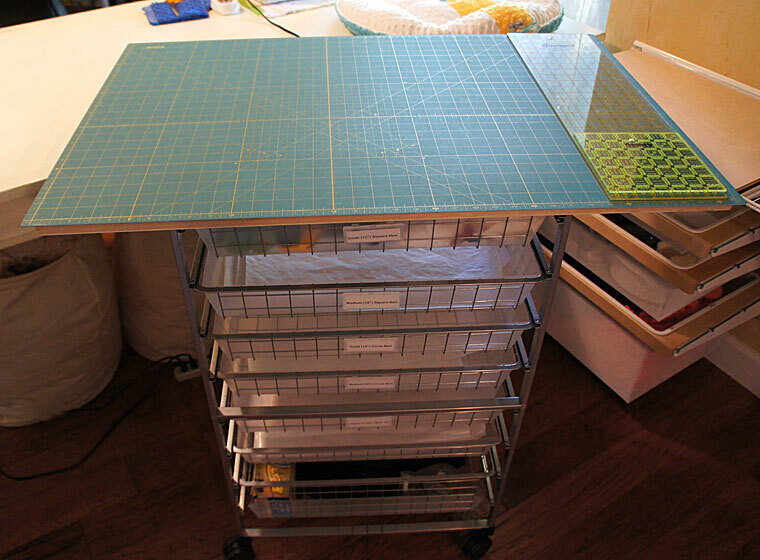 The other thing that helps me the most with my sewing tasks is my large sewing table. I have to admit I splurged here and purchased a dining table for my main work area. This table is big…long enough to hold three sewing machines side by side. And yes sometimes I have them all set up at once, and can quickly roll my work chair from one to the other. I have my regular machine and my serger, and a second regular machine that has black thread and a walking foot for sewing the Toughtek bases to my pet beds. And the best thing about my table is the built-in narrow drawer, which stores all my thread, scissors, and other sewing instruments. Keeps all that away from the kitties and neatly stored. All in all, a perfect sewing room guaranteed to keep me happy!! 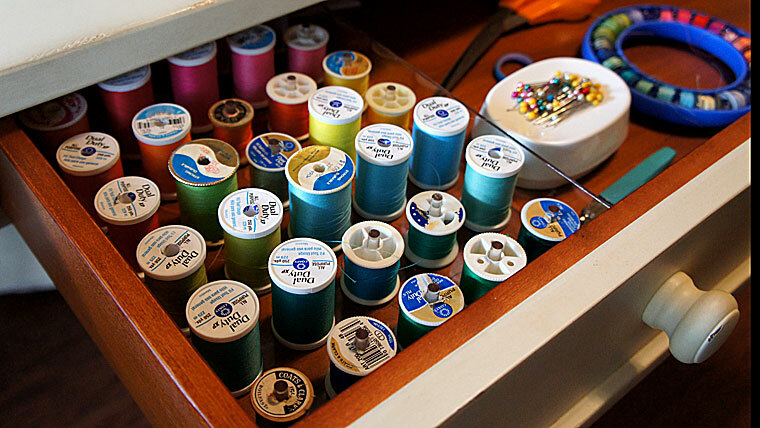 Do you sew, and if so do you have a favorite way to set up your sewing space? 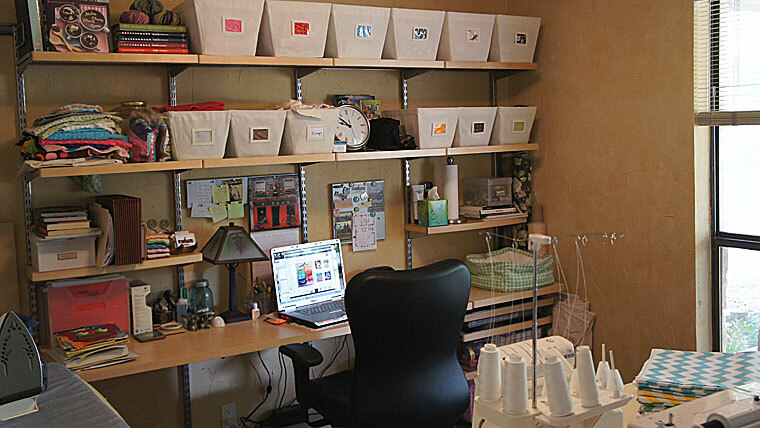 This entry was posted in Business, Etsy, Sewing and tagged Container Store, Cutting Mat, Dining Table, Elfa drawers, Rotary Cutters, Rulers, Scissors, Sewing, Sewing Studio, storage, thread. Bookmark the permalink. Yeah, but hey catnip toys are the best! !